November sees the premiere of another two Marvel shows and the return of Mythbusters with a new pair of hosts. We also have the continuing adventures of Hiro and Baymax, a holiday special featuring Poppy the Troll and a new series with a stretchy hero who originated in the ‘70s. Check below to find out when your favorite shows are premiering. 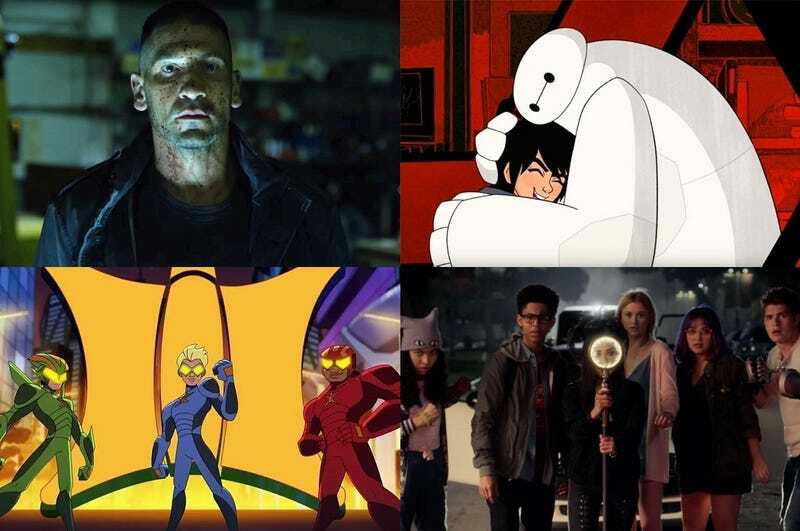 Photo: Clockwise from top left: The Punisher, Big Hero 6: The Series, Runaways & Stretch Armstrong. Mythbusters: The Search alums Brian Louden and Jon Lung will be featured on the new season where they will build and execute new experiments involving rocket powered swords, exploding gas tanks, airbag disasters and more. Now that the Bergens’ one holiday is gone—and the Trolls don’t have to worry about being eaten by their neighbors—Poppy, the eternally optimistic Troll queen, has made it her mission to bring a brand new day of celebration to Bergen Town. But just because Poppy won’t rest until the village embraces Ticklepalooza or Balloon Squeal Day doesn’t mean the Bergens are quite ready to launch a celebration as loud, crazy and glittery as the little Troll suggesting it. Follows a young woman-turned-angel, Allison Pyke, who is stuck on Earth and can’t seem to ring the right bells in order to pass through those pearly gates into heaven. When the love of her life, Patrick, shows up in New York City, it complicates Pyke’s journey as well as frustrates her angel mentor. The not-so-merry situation also turns into an unexpected love triangle with her friend with sometimes benefits, Barker. Three years after the series finale, the ambitious friends — along with some returning fan-favorite characters — come together during the holidays after a mystery assailant targets one of their own. Set in 43AD, when Britannia was a country ruled by powerful Druids and warrior queens, it follows the reluctant rise to power of Kerra, the daughter of the King of the Cantii. When the Romans invade Britannia, she and her arch-rival Queen Antedia are forced to put their differences aside to face their invaders. Wyatt and his brothers are coming to terms with the death of their dad, a wonderful, whimsical inventor who touched the lives of everyone who knew him. He leaves the boys with a copy of The Dangerous Book for Boys, and the how-to book inspires fantasies for Wyatt. While in his fantasy world, he reconnects with his father and learns life skills that help him navigate real life. Equal parts a high-concept thriller and coming-of-age drama, it follows the journey of an extraordinary young girl as she evades the relentless pursuit of an off-book CIA agent and tries to unearth the truth behind who she is. Based on the 2011 feature film. A demented killer taunts a retired police detective with a series of lurid letters and emails, forcing the ex-cop to undertake a private, and potentially felonious, crusade to bring the killer to justice before he is able to strike again. Based on the Stephen King book. The 10-episode web series follows a young Catherine Langford as she tries to solve the mysteries that lie beyond the Stargate in order to save Earth from impending doom. A 21st century love story that asks, “What would you do for love?” When a brilliant bookstore manager crosses paths with an aspiring writer, his answer becomes clear: anything. Using the Internet and social media as his tools to gather the most intimate of details and get close to her, a charming and awkward crush quickly becomes obsession as he quietly and strategically removes every obstacle – and person – in his way. Based on the Caroline Kepnes series.